Pontos Requerido: 13250 Os jogos não são compatíveis com dispositivos móveis e tablets. Por favor adicione este título à sua Lista de Desejos e inicie a sessão na sua conta the first club desde um computador para concluir o processo de solicitação. NOTICE: Activation key must be used on a valid Steam account. Requires internet connection. About the gameGal*Gun explodes onto Steam for its most outrageous adventure yet! 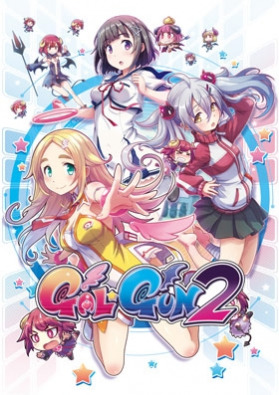 In the sequel to Japan’s notorious action game, an army of girls has fallen madly in love with you. Fend off their unwelcome advances with your Pheromone Shot and use gadgets to expel demons from their bodies in the most… audacious first-person shooter you’ll ever play! Key FeaturesThe Craziest Shooter Yet! Help swarms of girls escape their demon possessions by using your Pheromone Shot gadget for euphoric exorcisms. A Gorgeous New Cast! Woo the girl of your dreams in a twisting, turning story full of surprises. With the aid of alluring angel Risu, become romantically entangled with girl-next-door Chiru and childhood sweetheart Nanako. Become a Knight in Shining Armor! Manage your schedule to receive quests from the academy's love-struck girls, and satisfy their demands to unlock new missions and story scenes. Harness the Power of Vacuuming! Equip the awesome Demon Sweeper gadget, capable of sucking up Gal*Gun 2's pesky demon menaces… and perhaps some clothing too! System Requirements Windows - Minimum OS Version: Windows 7, 8.1, 10 (64 bit only) Memory: 4GB DirectX: 11 Disk Space: 8GB Windows - Recommended OS Version: Windows 7, 8.1, 10 (64 bit only) Memory: 4GB DirectX: 11 Disk Space: 8GB ©INTI CREATES CO., LTD. All Rights Reserved. Published by PQube Ltd.